We were in Seville a fortnight after Easter. 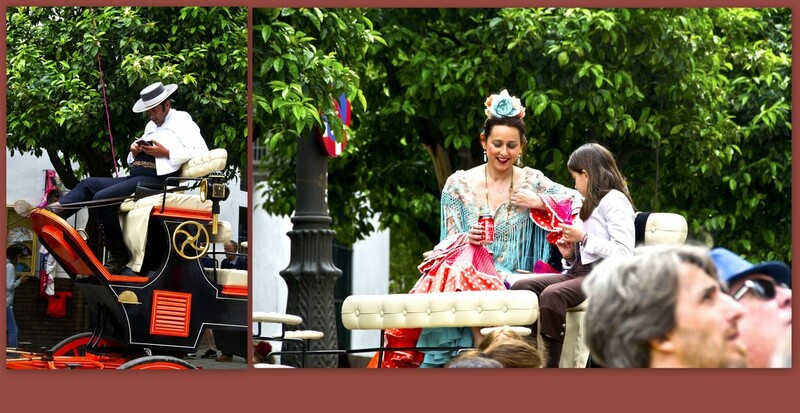 We arrived on a Saturday early in the morning and after the alcazar were strolling around the historic centre and were impressed to see the ladies dressed in these beautiful Andalusian costumes of days gone by – or flamingo dresses. They were so lovely and elegant. On a horse drawn carriage there was this lovely lady with the child and while wearing this beautiful traditional dress she had a Coca Cola can in her hand. The coachman was also in a tradional attire and what was he playing with – his mobile. I smiled as I watched them as if the two things in each case did not seem to go with each other. Here is a collage to show them both. We later learnt that we arrived in Seville on the last day of a week-long festival in which locals are encouraged to wear traditional clothing. That was really some unexpected luck for us and we enjoyed it. Many thanks for all your views, your comments and fav's on yesterday's picture. Oh aren't their festival clothes beautiful? So colourful and wonderful with the carriages too. Wonderful outfits and yes, an interesting contrast of yesterday and today. Such a wonderful sight, great shot. Such beautiful costumes. Good that despite this high tech age traditions are still in evidence. It is hard to get a true picture of the past when there are so many modern things we seem to be addicted to, like cokes and mobiles. Nice capture. The costume are beautiful. This is really lovely, Dione. Beautiful!! Great to capture this!! How very lucky for you - this must have been a grand spectacle. It is funny to see the modern items in the photos. quite a statement, traditional clothing with coca cola and smart phones ! The costumes are wonderful and the mobile phone and can of coke really bring the shot into the 21st century. Sounds a fascinating town to visit!